Hi, This is one more guide on swap internal storage with the SD card in Android Device. Last one guide is not working on KitKat and Lollipop, So we makes new guide for Android Smartphone. Here is a simple, safe and easy step by step tutorial to swap internal storage with the SD card in Android Smartphone with images. Lots of viewer are telling us to make a new guide on swap internal storage with the SD card in Android Lollipop and KitKat Devices. This is so simple process and I try to make it most easy and safe guide. Lots of Android Device users face low phone memory error and we all want more free space on your Android Smartphone storage for download and play large size games and install lots of apps. But we can’t do it because of low phone memory (space). If you are facing this problem then you can swap internal storage with the SD card in Android device and increase your internal storage. In Previous guide, we are using vold.fstab file and manually swapping internal storage with the SD card by edit this file. In this process, we are using two app for swapping internal storage with the SD card. We want a rooted phone and WSM Tool app, XInternalSD app. I am using these app to swap my Android phone internal storage with the SD card, and according to my experience this process safe for your device. But safe side, you must take a backup of your phone, then do it. And first read all steps, if you don’t understand these steps, then don’t do it and tell us your problem via comment, I will try to resolve your issues. Step 1: We need a rooted phone for this process, if your phone is not rooted then first of all root your phone. You can find your phone root guide of this blog click here and Download and install WSM Tool app click here and XInternalSD app click here on your Smartphone. Step 2: Now install WSM Tools and XInternalSD apps on your phone, then open the WSM Tools app, you will get a popup tab from Su app for giving root permission to WSM Tools app, now tap on the grant option. Then click on Install, now you will get a popup message for confirmation, So tap on OK option after then you will get a new popup message for reboot your device, So tap on OK again. See in this image. Step 3: Now Open WSM Tools, you can see the XInternalSD App in modules and swipe to On XInternalSD App. Now you will see a Pop up message ” WSM Module list was updated changes will become active on reboot”, You can see all steps in above image. Step 4: After reboot your device, go to app menu and open XInternalSD app then you will see “Path to internal SD card” option and under this option you will see this path “/storage/sdcard1” (see in the above image). If you will not find this path then tap on “Path to internal SD card” option and set manually this path “/storage/sdcard1” (see in the above image). After this tick on “Enable for all apps” and click on “Enable for apps”, then choose apps which you want to move External SD. See in the above image. Now reboot your phone or device. that’s all. I hope you like this swap internal storage with the SD card in Android guide from which you will be able to easily swap internal storage with the SD card in Android without any extra efforts. If feel any problem in this guide then please use comment box. Thanks to all. any body something about Mai_X2 mobile … they says it has 8gb internal mamory but here is nothing like this it has only 18mb internal space so plzzzzzzzzzzzzzzzzzzzzzzzzzzzzzzzzzzzzzzzz help ma some way?????????? Can this work for huawei y3 II. need a root app. KINGOROOT APP WILL HELP (KEEP WIFI ON WHEN ROOTING) !!! Hi I have exposed installer on my Samsung Galaxy V will it work? I also have 8gb memory card with 6gb left. Is it possible to merge sd card with internal storage in samsung a5 2016 marshmallow? After installation of wsm tool first I lost it .then found it by es file manager. And when I tap it to open, android pops me up saying that “sorry can not start this application”. so I can’t proceed. Will it work on Jellybean devices? Hi Reza, Here is guide for Jelly Bean. I followed all steps on LG Volt running KitKat. When I select “Enable For Apps” and choose what I want to move, what do I do next? I tried restarting and rebooting phone and no apps were moved. What step comes after Enable for Apps? HI. I had followed evry step and I had selected the apps and restarted my phone but it didn’t moved .. assist me to sort this out. I have followed all the steps properly but still no change. I am using it for Sony Xperia S Lt26i. I have selected the apps I want to move to internal storage but after switching it on again it reflected no change. Could you please guide me further? bro are you sure your device is rooted and followed all steps. i am using this method personally redmi note 3G and YUreka plus its working properly. so you just try again and read all steps carefully. Can i use this method on samsung j5 2016 marshmallow?? Hi I have a problem with this metod. I have got KitKat 4.4.2 and I have damaged internal storage. Can I use something else insted of WSM Tools? I have LENOVO A606 and i like to increase the Space init as i have only 3.25 Gb left on my phone though i have SD Card of 8GB is installed on it. So which option is best for me either “Swap internal storage with the SD card in Android Lollipop and KitKat” OR “Increase internal memory in Android Mobiles in easy steps” as I’m planning to get 32GB memory Card. i tried both the WXM TOOLS and the WXM_EXPOSED_FIX.zip on my android tablet with Lollipop version 5.1.1. but the wxm tools is displaying an error message to me i can send you the screen shot if you could give me your email address… but the other XinternalSD file works and i did change the path to internal SD card as shown on the scren shots but unfortunately nothing hapened even after reboot as the application whichi mentioned to take the path of he SD card instead of the internal storage is still taking the internal storage path instead of the sd card. I need to swap external sd storage To internal storage not apps.my phone is unite 2 kitkat and i am rooted. I dont want to move apps to external sd card but i want to swap external storage to internal and internal storage to external. I am using mmx unite 2 kitkat.i am rooted.i want to swap storage only.if u know send me the link. wsm is not working on that. WSM is not yet compatible with Android SDK version 21 or your processor architecture (armeabi-v7a). hi, will it work with the kingo root app or do I need to download a specific root app for this? thanks! This guide needs a rooted phone. Whether you root your phone by kingroot app or else app, it does not matter. Definitely works for me on kit kat 4.4.4 with ZTE FIT 4G. Good thing is you can choose what previous apps will stay or not on internal storage. Allows me to store heavy utorrent downloads and offline GPS maps on SD card. Finally ! What do you mean by phone storage ? I follow your guide made the swap right after I install my phone. Or it should be done manually every time a new app is installed ? So tell me what should I do? You can use any free root explorer like explorer app or ES file explorer app. Your apps won’t run if you removed your sdcard. Yes, you could reverse the procedure. i am using micromax A177 canvas Juice and i have followed all the steps which you have published above but still my phone is showing insufficient storage. app is not moving to external sd card .. pls help what to do..
are you sure you follow all steps in this guide for swap internal storage. if yes its working . you can download this zip file click here and flash it via TWRP. now open WSM Tool its working properly. Can you help and teach me how to install the zip file with TWRP? Dosen’t work worth crap on samsung tab 4 7.0, os 4.4.2, followed all the steps and everything installed correctly and there was no change to anything. Apps are still in the same place, and new apps still download to internal. Still only have 8gb of space to use internal and 32gb external that I can’t use as primary. its working method read carefully guide and try it. hi. did you ever figure this out? i have the same samsung Tab running 4.4.2 and would love to solve this problem. when i try to install wsm tool app it says it isnt compitable with android proccesor how can i fix this? I have a Vodafone smart 4 turbo running KitKat 4.4.4, will this work for me? Will this method erase my internal storage or my exterior sd card? no this method will not erase your internal or external storage. I want to Swap “Phone Memory to External SD Card”. Is it possible? If yes please mention the procedure/ steps. yes it is possible. please try these guides. MicromaxL A108. I tried the total steps but still my phone shows “insufficient storage”. Move your app on your phone internal storage. Should the sdcard be partitioned or formatted in any specific way? And can I have two partitions (one for FAT, one for ext4) and direct the apps to use the ext4 partition? And what of Internal Storage? Will Internal Storage ever be used by the phone automatically for anything or will it treat the sdcard as all internal space? how about zte v830w? can use that app? Where will the apps from play store be downloaded into? After successful swapping if I will unroot my phone, it will work or not? Hi I am using micromax A120. It have 900 MB app storage and 8 GB internal storage does this method incrase my app storage?? And one question more i have bricked my phone early not by doing this but something, so i again not want to take risk. Please tell me by doing this method surely (means 100%) my phone not bricked???? Does this is safe method? Please tell me?! I have a problem, my phone is a Samsung gt-S5660 and doesn’t support the WMS app, I think its because of my processor. what should I do ? Same problem with WSM tools. Its not compatible with my processor either. I’m on an LG Volt 2. Is it possible uploading app tools on another server? Hey, thanks for this instructionals. I did it to my samsung kitkat. I have a quetion though. Whenever I download a new game it still goes to the internal drive. This is not what I am expecting so I am a little disappointed. Maybe I miss a step? I check the enable all for apps and check all of it. I was expecting that even the download from playstore would download it directly to the sdcard, but its not whats happening. Does this method can use in android lollipop SAFETY? ok so. i need something similar. i have a nexus 7 2012 kitkat and i want to be able to use a 256GB flash drive as internal memory. i have a OTG cable from the tablet to a USB hub and the flash drive and a DAC. i have installed stickmount app to be able to mount the usb. I dont know what path to use on xinternalsd. any suggestions? yes you can swap your apps to external sd by this guide. yes, you can swap internal storage with your external sd card.read this guide and try. I am sure this is working on Nokia X2 Cm 11 kitkat. 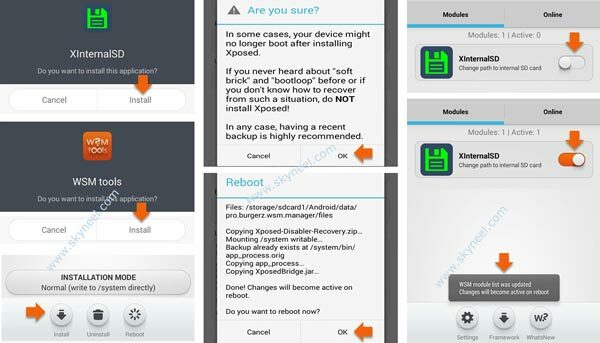 xposed installer haven’t support lollipop on x86 intel-based android yet, do you have any solution? Read all steps Care fully and try agian i hope you can do this. your phone is must be rooted. No, this is safe guide. Yes I am sure because i am using it on my phone.